You are invited to attend our monthly dinner (except as noted) held at 6:30 pm on the third Tuesday of each month at 5th & Warren, Bremerton -Stated at 7:30 pm. * We provide bicycles to grade school children who read the most books as part of the Bikes-4-Books program. 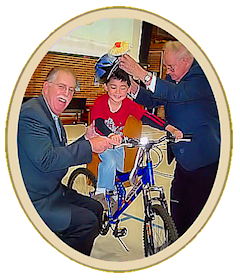 * We fund local Masonic youth group activities. * We send needed personal items, books, etc. to overseas military personnel. Today in North America, the Masonic Fraternity continues the tradition by giving almost $2 million each day to causes that range from operating children’s hospitals, providing treatment for childhood language disorders, treating eye diseases, funding medical research, contributing to local community service, and providing care to Masons and their families at Masonic Homes. 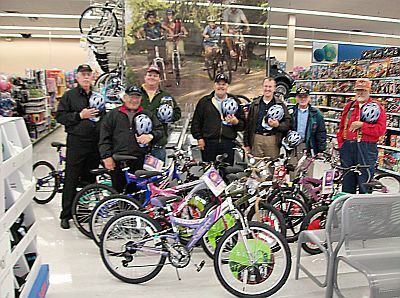 The Grand Lodge of Washington supports a number programs, including support to the Masonic Youth Groups, CHIPS children ID program, Scholarships, Christmas Angels, and the Bikes-4-Books program in local Schools.